• The paper addresses the potential impacts of CO2 enrichment in the marine environment. • Two different marine microalgae species were used through four consecutive generations. • T. chuii showed a slight adaptation through generations, in terms of metabolic activity. • P. tricornutum was the most sensitive one with almost total growth inhibition in the fourth generation. • The results give valuable data about the transgenerational effects of CO2 enrichment on microalgae. As a result of the increasing pressure provoked by anthropogenic activities, the world climate is changing and oceans health is in danger. 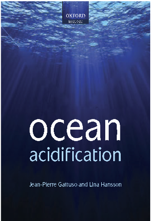 One of the most important factors affecting the marine environment is the well-known process called ocean acidification. Also, there are other natural or anthropogenic processes that produce an enrichment of CO2 in the marine environment (CO2 leakages from Carbon Capture and Storage technologies (CCS), organic matter diagenesis, volcanic vents, etc). Most of the studies related to acidification of the marine environment by enrichment of CO2 have been focused on short-term experiments. To evaluate the effects related to CO2 enrichment, laboratory-scale experiments were performed using the marine microalgae Tetraselmis chuii and Phaeodactylum tricornutum. Three different pH values (two treatments – pH 7.4 and 6.0 – and a control – pH 8.0) were tested on the selected species across four consecutive generations. Seawater was collected and exposed to different scenarios of CO2 enrichment by means of CO2 injection. The results showed different effects depending on the species and the generation used. Effects on T. chuii were shown on cell density, chlorophyll-a and metabolic activity, however, a slight adaptation across generations was found in this last parameter. P. tricornutum was more sensitive to acidification conditions through generations, with practically total growth inhibition in the fourth one. The conclusions obtained in this work are useful to address the potential ecological risk related to acidification by enrichment of CO2 on the marine ecosystem by using consecutive generations of microalgae. • Enhanced weathering of ultrafine peridotites and basalts in seawater was studied. • Open system experiments were performed in batch reactors at ambient conditions. • Peridotites induced CO2 drawdown directly from the atmosphere via mineralization. • The basalt did not yield any significant changes in seawater composition. • The precipitation of sepiolite could reduce the carbon sequestration efficiency. Enhanced weathering of mafic and ultramafic rocks has been suggested as a carbon sequestration strategy for the mitigation of climate change. This study was designed to assess the potential drawdown of CO2 directly from the atmosphere by the enhanced weathering of peridotites and basalts in seawater. Pulverized, and ball milled dunite, harzburgite and olivine basalt were reacted in artificial seawater in batch reactor systems open to the atmosphere for two months. The results demonstrate that the ball-milled dunite and harzburgite changed dramatically the chemical composition of the seawater within a few hours, inducing CO2 drawdown directly from the atmosphere and ultimately the precipitation of aragonite. In contrast, pulverized but unmilled rocks, and the ball-milled basalt, did not yield any significant changes in seawater composition during the two-month experiments. As much as 10 wt percent aragonite was precipitated during the experiment containing the finest-grained dunite. These results demonstrate that ball milling can substantially enhance the weathering rate of peridotites in marine environments, promoting the permanent storage of CO2 as environmentally benign carbonate minerals through enhanced weathering. The precipitation of Mg-silicate clay minerals, however, could reduce the efficiency of this carbon sequestration approach over longer timescales. 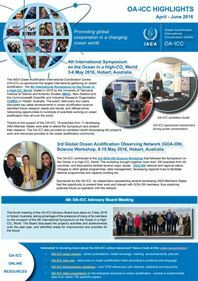 Termination effects of large‐scale Artificial Ocean Alkalinization (AOA) have received little attention because AOA was assumed to pose low environmental risk. With the Max‐Planck‐Institute Earth System Model, we use emission‐driven AOA simulations following the Representative Concentration Pathway 8.5 (RCP8.5). We find that after termination of AOA warming trends in regions of the Northern hemisphere become ∼50% higher than those in RCP8.5 with rates similar to those caused by termination of solar geoengineering over the following three decades after cessation (up to 0.15 K/year). Rates of ocean acidification after termination of AOA outpace those in RCP8.5. In warm shallow regions where vulnerable coral reefs are located, decreasing trends in surface pH double (0.01 units/year) and the drop in the carbonate saturation state (Ω) becomes up to one order of magnitude larger (0.2 units/year). Thus, termination of AOA poses higher risks to biological systems sensitive to fast‐paced environmental changes than previously thought. • Planetary Boundaries: going from bio-physical to related socio-economic indicators. • Setting limits at country level considering the role of countries and people needs. • Limits and footprints are computed for the world and for a case study: Switzerland. • Global priorities: Climate Change, Ocean Acidification, Biodiversity, Nitrogen Loss. The Planetary Boundaries concept is a recent scientific framework, which identifies a set of nine bio-physical limits of the Earth system that should be respected in order to maintain conditions favourable to further human development. Crossing the suggested limits would lead to drastic changes in human society by disrupting some of the ecological bases that underlie the current socio-economic system. As a contribution to the international discussion, and using the case of Switzerland, this study proposes a methodology to apply the Planetary Boundaries concept on the national level. Taking such an approach allows to assess the environmental sustainability of the socio-economic activities (e.g. consumption) by the inhabitants of a country in a long-term global perspective, assuming that past, current and future populations on Earth have similar “rights” to natural resources. The performance of countries is evaluated by comparing the country limits with their environmental footprints according to a consumption-based perspective. An approach was developed to: i) better characterise the Planetary Boundaries and understand which limits can effectively be currently quantified; ii) identify related socio-economic indicators for which both country limits and footprints can be computed; iii) compute values for limits, footprints and performances (at global and country level); and iv) suggest priorities for action based on the assessment of global and national performances. It was found that Switzerland should, as a priority, act on its footprints related to Climate Change, Ocean Acidification, Biodiversity Loss and Nitrogen Loss. The methodology developed herein can be applied to the analysis of other countries or territories, as well as extended to analyse specific economic sectors.